Last week Jordan announced plans to build a nuclear reactor by 2013. Other are due to follow. This is done to answer the country’s energy needs which are due to double by 2030. This is a big issue as Jordan imports 95% of its energy. It is the opportunity to focus on an interesting article on how nuclear interests as much as 60 new countries. To date 30 nations are already using this energy source to bring gigawatts of low carbon electricity to their grids. A low carbon alternative to oil and coal, whose productions are likely to peak sooner than expected, nuclear deserves to me a more positive look. Jordan is forging ahead with a peaceful nuclear program that would turn the energy-poor kingdom into an exporter of electricity, nuclear chief Khaled Tukan said. “We are moving in great strides in the field of civilian nuclear energy in order to stop being dependent on the import of fuel,” said Tukan, who chairs the Jordan Atomic Energy Commission. Jordan is the latest Sunni Arab country, among them Egypt and pro-Western Gulf states, to announce plans for nuclear power programs in the face of Shiite Iran’s controversial atomic drive. “Our goal is transform Jordan from net energy importing to net electricity exporting country by 2030,” added Tukan, whose country imports 95% of its energy needs. Jordan’s 2007 energy bill was $3.2 billion, the equivalent of 24% of its total imports and 20% of gross domestic product. The kingdom has six power stations with a total generation capacity of 2,400 megawatts, but it has been forced to buy 5% of its electricity needs from neighboring Arab countries in the face of growing demand. In the country of nearly six million people, per capita electricity consumption is estimated at 2,000 kilowatts a year. “In 2030, electricity consumption will double,” added Tukan, noting that ” atomic energy is the most logical solution” to meet his country’s growing power needs. If you have been reading this blog for some time, you know that I am a supporter of this energy solution as it is low carbon, poses no more problem than traditional energy source if operated safely and that waste won’t be a problem by the end of our century. Some 60 countries are considering the use of nuclear power, in addition to the 30 that already do so. One of these is Chile, which commissioned Finnish experts for advice. The figures come from the International Atomic Energy Agency (IAEA), which last week held a four-day workshop to develop tools to help those countries make the decision. It said that 20 of the states it is helping could have a program in place to use nuclear by 2030. It is also helping a number of regional programs. 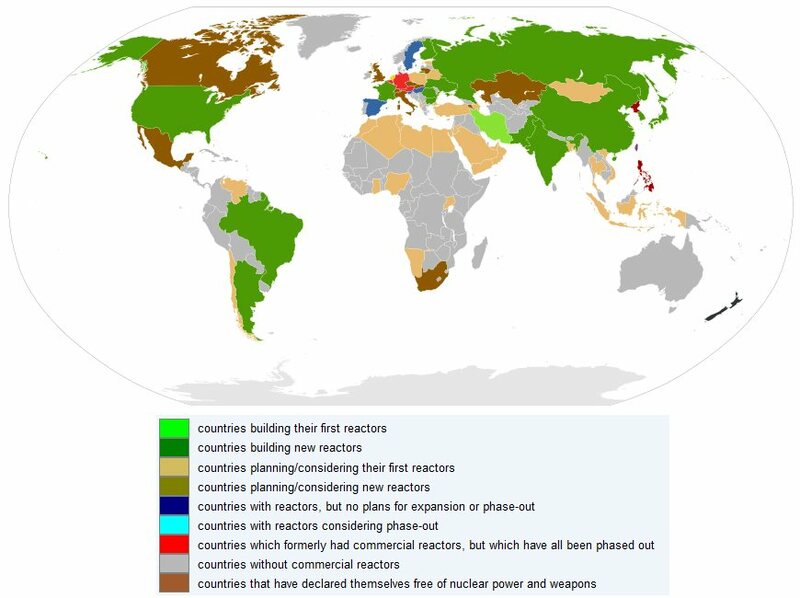 To the map below provided by Wikipedia, to the 449 reactors currently in operation, 32 are being constructed, 51 are planned or ordered and no less than 217 may be built. This is corroborated by the data from the IAEA as it forecasts 60 % more nuclear plants by 2030.